Sign up for Audible by 2pm ET on 2/2/17 to get a FREE entry into the $2M Big Game Bowl. Plus, you’ll get a copy of Tom Brady's new audiobook and another audiobook of your choice. Welcome to The Big Game Bowl! The Promotion will consist of one (1) Fantasy Football Contest on Sunday, February 4th, 2018. This is a multi entry contest, with a maximum number of entries per user being one hundred and fifty (150) entries. Any instance of registering multiple accounts on FanDuel in order to gain additional entries into a contest will result in automatic disqualification from the Promotion, revocation of any prize awarded in the Promotion and potential suspension from FanDuel. To gain entry into the $2M FanDuel Big Game Bowl on Sunday, February 4th, 2018, users can pay the entry fee of $9 USD dollars, or users can gain one (1) free entry by downloading Audible through one of FanDuel’s promotional channels (promotional channels being email, interstitial, landing page, social posts) anytime between Saturday, January 27th, 2018 and Thursday, February 1st, 2018. After downloading Audible through a FanDuel promotional channel, users will be given a voucher to enter the $2M FanDuel Big Game Bowl on Sunday, February 4th, 2018. Users will receive the voucher from FanDuel via email on Saturday, February 3rd, 2018. Users must redeem the voucher and enter their preferred lineup for the $2M FanDuel Big Game Bowl prior to the contest lock time to be eligible for any prizes in that particular contest. Contest entry not guaranteed as user must redeem voucher before contest is full. 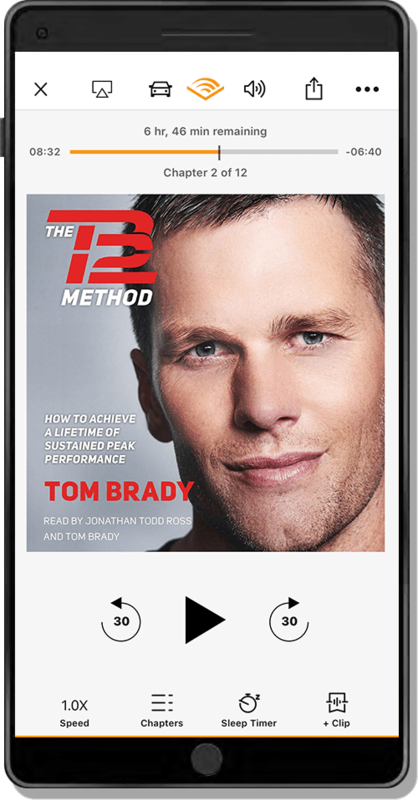 In addition to a voucher for free entry into the $2M FanDuel Big Game Bowl on Sunday, February 4th, 2018, users who download Audible will also receive a 30 day free trial of Audible which includes a free audiobook of their choice and a free copy of the audiobook The TB12 Method: How to Achieve a Lifetime of Sustained Peak Performance by Tom Brady. The $2M FanDuel Big Game Bowl on Sunday, February 4th, 2018 will be operated pursuant to FanDuel’s standard Rules and Scoring for NFL contest (available here: https://www.fanduel.com/rules). Employees, officers, and directors of FanDuel and Audible are not eligible to win any prizes as part of this Promotion. Contest is subject to all federal, state and local laws and regulations. FanDuel may request US resident prize winners to provide address and social security details prior to receiving their prize if their prize exceeds $600 in value. Winners are responsible for paying all taxes, fees, registration and insurance, for any prizes won in connection with this contest, including any non-cash prizes. I represent that I am over 18 years of age. I agree hereby to provide government-issued photo identification to FanDuel to verify my identity and date of birth. I agree to refrain from any behavior or communication during the $2M FanDuel Big Game Bowl promotion that would harm the image or reputation of FanDuel, Audible, or the FanDuel user community.